The 23-year-old missed the series against Pakistan in the UAE after dislocating his thumb on the day he received his first Test call-up. Surrey have not put a precise time frame on Ansari's recovery from his operation, and he currently has a splint on his thumb for support. 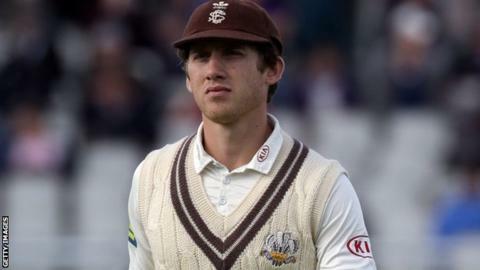 The left-arm spinner was included in England's Performance Programme (EPP) and Lions squad for the winter despite his injury, but his participation remains in the balance. Ansari had a fine 2015 season for Surrey, scoring 771 first-class runs and taking 44 wickets as they won the Division Two title. He is keen not to rush his comeback, telling BBC Radio London: "After I did it I overreacted and said something like 'that is the worst injury I have ever seen'. "At the time it was frustrating but I was thinking more about the health of the thumb and the long-term. "My priority was to make sure I did what was best for my thumb, and let the cricket take care of itself." Meanwhile, Surrey wicketkeeper-batsman Gary Wilson has signed a new contract that will keep him at the club until the end of 2017.